StudioWare panels are adaptable interfaces that give you more control over your outboard gear. While all owners of Cakewalk version 6.0 and later are able to use StudioWare Panels, only Pro Audio allows you to edit and design your own panels. We encourage you to read the User's Guide chapters on StudioWare before designing your own panel project. Studying an existing StudioWare panel can help you learn about panel design. Use them as a guideline for your first projects. The technique of opening the code of a finished project and studying how it works is called reverse engineering. It's one of the best ways to learn about any programming language. Cakewalk ships with many other finished StudioWare panels. Additional panels can be downloaded here. The learning curve for StudioWare design can be steep. Some familiarity with a computer programming language may be needed to create Panels that work properly. We can help you understand the concepts that apply to StudioWare, but Cakewalk Technical Support cannot write or debug code. Please use and enjoy StudioWare, but learn as much as you can about it first. We recommend that you review the StudioWare Tutorial and StudioWare View chapters in the Cakewalk User's Guide before trying to use StudioWare. Select one or more tracks, then open Cakewalk's View menu and select StudioWare.If you've recently upgraded from an earlier version of Cakewalk, you may notice that StudioWare view looks and behaves a lot like Faders view. We've replaced the Faders view with StudioWare Panels which gives you much more flexibility. You can open several StudioWare views simultaneously, and each new view shows controls for the selected tracks only. When you select MIDI tracks and open a new Panel, you get controls that send MIDI data for volume, pan, chorus, and reverb levels, plus a mute button, for each track you selected. When you select audio tracks and open a new Panel, you get volume and pan controls. 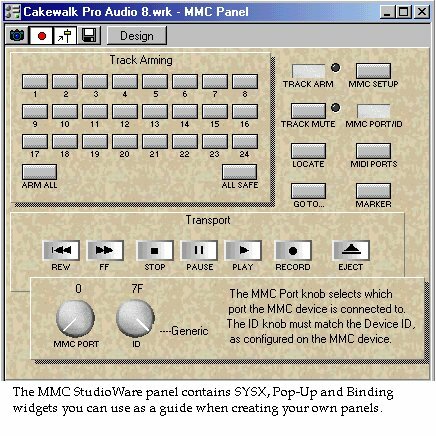 Cakewalk versions 6 and later come with several ready-to-use custom Panels for the Roland VS-880, the Yamaha ProMix 01, and other popular studio products, plus a generic MIDI Machine Control Panel. To open these Panels, and any others that you've created and saved, choose the File, Open command. This opens the Window Layouts dialog box, which gives you a list of Panels that you can open. StudioWare also lets you design your own controls. You can change the look, placement, and behavior of every control in the view. When the Design button is up, as it is by default, you are in Use mode. When it is down, you are in Design mode. You may want to use StudioWare to create on-screen controls for your FX unit, digital mixer, synthesizer, sampler etc. If your device or instrument has a MIDI In port, you can create Panels that transmit standard MIDI messages such as Notes, Controllers, SYSX, and MMC Commands. Creating this type of Panel requires that you tell Cakewalk how to "talk" to the MIDI accessible device. That is, you need to know what MIDI messages the device uses to communicate. In most cases you will need a copy of the device's MIDI Implementation Chart. If you're unsure of what Controller messages your MIDI device will respond to, check the MIDI implementation chart. Most manufacturers provide a basic MIDI implementation chart in the product's manual (it's often at the back, usually in one of the appendices). This chart lists the MIDI controller messages that the device can send and receive. This is really important information to have. It tells you whether you can send messages like Pitch Wheel, Modulation, and Aftertouch to your synth, sampler, or other MIDI device. Along with a MIDI implementation chart, your MIDI device's manual will probably also have a section that lists that device's Sysx messages. Every instrument has its own set of Sysx messages that no other instrument will respond to (hence the term "System Exclusive"). These Sysx bytes, often written in hexadecimal, give the device or instrument specific instructions about what to do. If you know the proper Sysx messages to send, you can set up a StudioWare knob or slider to open and close a filter, raise or lower the attack level of an amplitude envelope, control LFO rate and depth, or control faders on an automated mixing console. Even if you design Panels that can control every parameter in your synth, you probably won't be able to replace any comprehensive editor/librarian programs that you own. However, you'll still be able to access many of your instrument's functions directly from Cakewalk, with virtual controls that are easy to use and set up the way you want. If your instrument's manual is missing this Sysx information, or isn't comprehensive enough for what you're trying to do, contact the instrument's manufacturer for a complete list of the instrument's Sysx messages.